Reason for Stay: Presented with facial droop and slurred speech. How did this patient hear about Chatham Hills? Social Worker referral. John was presented at Morristown Medical Center on October 10, 2017 with complaints of facial drooping, slurred speech and collapsing of his legs while walking. During his stay, he had gone through multiple tests to find out the cause of his symptoms. John underwent a CT scan where the results came back determining he had a mild stroke. John was notified that he would have to go to a rehabilitation facility due to the decline in his functional status. Upon arrival to Chatham Hills Subacute Care Center, John was greeted by professionals who anticipated his arrival. 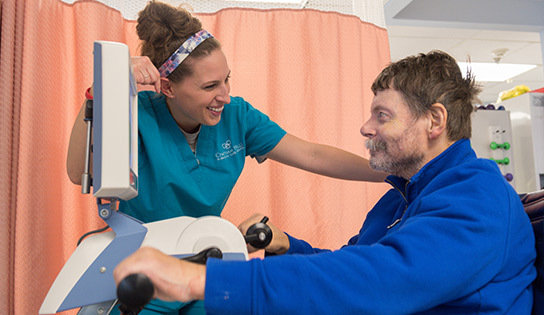 Within the first 24 hours of his stay, he was evaluated by the clinical team, the administrative staff, both his physical and occupational therapists, and many other valued members of the Chatham Hills team. John was evaluated by his therapists to determine the level of care he was going to need. At the beginning of his stay, John needed assistance with all activities of daily living. He was only able to ambulate 30 feet using a rolling walker and was unable to shift his weight safely without loss of balance. He had impaired balance and was at an increased risk for falls. John participated in several activities to assist in improving his dynamic standing balance and strength. John made consistent progress during therapy towards reaching his goals and is continuing to perfect his techniques. His personal goal was to be able to go back home walking safely. John was independent prior to his admission to the hospital. His wish when he came to Chatham Hills was to be able to go back home to his wife and family. With hard work and determination, team Chatham Hills is very pleased and excited to congratulate John for the incredible success he achieved while under our care. We wish him nothing but the best!